ARTINI 2012 is tomorrow night! 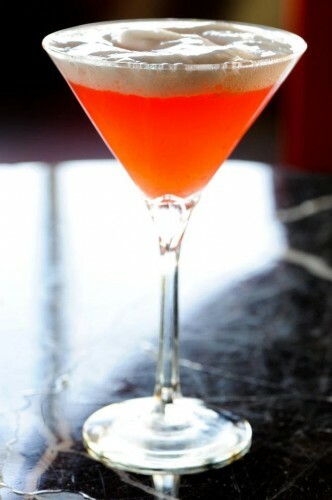 Eleven talented bartenders have created cocktails inspired by works in the Corcoran Gallery of Art. Every Friday the We Love DC drinks team wrapped up the week’s feature nights with reviews of each ARTINI entry, to culminate at the (sold-out) gala on March 31st. Check out our notes from Week One, Week Two and Week Three, and find out what we thought of the final week. Alexandra Bookless, bar manager at the Passenger, has gotten where she is by having an encyclopedic knowledge of classic cocktail recipes combined with an excellent palate that allows her to create new twists on just about anything based on a customer’s mood. Approaching cocktail recipes as formulas (which I have pointed out before are magic) makes it possible to see where a substitution here or an extra ingredient there will create something all-new (or at least something that hasn’t been printed in a hundred different recipe books). All of that is a really long winded way to say that if the Dance tastes kind of like a Margarita to you, well, that’s because it takes off from the Margarita formula. Served in a tall glass, the Dance takes its inspiration from Rob Fisher’s sculpture titled They Shoot Horses, Don’t They?. 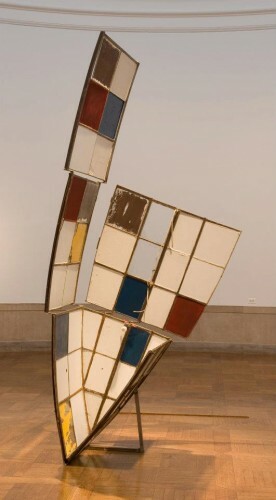 Rob Fischer They Shoot Horses, Don't They?, 2008 Steel, mirror, glass, paint, and light bulb, 120 x 36 x 42 inches. Courtesy of the Corcoran Gallery of Art. 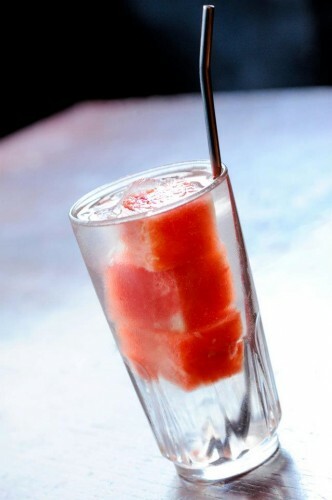 The geometric color pattern in the art is mimicked by the addition of coconut and watermelon ice cubes (carefully stacked in the glass before the drink is built); the Margarita formula is expanded upon with Hellfire Habanero Shrub and Orange Cream Citrate from Bittermens, then topped with soda water for fizz. The drink changes as the coconut and watermelon ices melt, adding additional subtle flavor cues and encouraging you to take your time finishing it. I found myself longing for a salt rim, more out of a Pavlovian response to tequila, lime, and Cointreau than anything else, but this was a fine cocktail that succeeded both as a work inspired by art and as something I could see going on a bar menu. “Wow, this tastes a lot better than I thought it would when I saw it,” said my surprised companion upon sampling the final feature night ARTINI. We had seen the bright-pink drink with thick foam dispensed from a whipped cream maker and had braced for something cloying and creamy. While not off the charts, it certainly was sweet, with St-Germain and brown sugar simple syrup – but the froth on top was a light lemon meringue which dissolved into the drink adding a bit of additional tartness rather than rich dairy. It strongly recalled the childhood candies Sweet Tarts, though I suppose those did not come in blood orange, which gives the drink its bright color and citrus-y flavor. Cocktail created by Joe Ambrose of P.O.V. at the W Hotel for ARTINI 2012. Inspired by Terry Winter's "Theophrastus Garden 2" 1982. Photo by Dan Swartz. Perhaps the thing this drink tasted the least like was alcohol. The cocktail employed a pre-mixed base of Beefeater gin and Russian Standard vodka, but in the finished product neither could really be particularly detected. It grew on me as I drank it, particularly as the foam integrated, but it failed to be particularly memorable. This drink gave me an impression of a good concept, without strong execution. Blood orange, gin, that lemon meringue, all showed promise – but the final composition was a bit too muddled (and, dare I say, commercial) to really be a notable work of art. Final thoughts from our intrepid lushes? With several drinks leaning towards the sugary, I anticipate a lot of hung-over gala attendees on Sunday morning. It’s hard for me to predict the art component of ARTINI judging, but I’ll say that I felt the drinks I had were consistently more successful cocktails on their own merits than the ones I had last year (although it should be said that Ron Flores must have fixed the problems I had with the house-made Slim Jim in his Coleman’s Juice, given that it was the eventual winner). For creative flavor and texture alone my vote would be with Frank Jones’ Silk Veil, but I wasn’t sure about how it tied in with its inspiration. Alexandra Bookless and Rachel Sergi both nailed the visuals with their cocktails, but I suspect the judges may be won over by Chantal Tseng’s Horsefeather. The earthy, spicy flavor is especially evocative of its inspiration. With Chantal Tseng, Rachel Sergi and Alexandra Bookless’s cocktails all hitting the high bar for both taste and artistic inspiration, I’m hopeful that the judges and the public agree with me that this year’s ARTINI is all about the ladies. But there’s always last year’s winner Ronald Flores, whose rooibos tea inhanced cocktail will be hard to beat. Whoever wins, it’s sure to be a night filled with gorgeous fashion and boozy, beautiful drinks. ARTINI isn’t a race to see who can drink all eleven cocktails. It’s a chance to sip something exquisite made by a gifted bartender, in an elegant setting surrounded by art, and all for a good cause. Have fun, and hydrate! Funny, the one drink that hands down won the entire competition, was the one your reviewer liked the least. Time to find a new “reviewer” perhaps? I tasted the other three ladies’ cocktails she mentioned and quite frankly, they weren’t that great. Seems that the cocktail portion of this blog may be a little biased towards certain individuals. Hi Cocktail Nerd, thank you for your comment. One drink did not win the entire competition. Ronald Flores of Art & Soul won the Washingtonian’s Fan Favorite, voted by the online public, while Joe Ambrose of POV won the Critic’s Choice, voted by a panel of judges. I’m sure every individual who voted has their own set of preferences towards certain liquors and taste combinations, as well as the drinks style of certain bartenders, as do all lovers of cocktails. Writing about drinks is a matter of subjective taste and opinion, as everyone’s palates and personal experiences are different. As their editor, I stand by Brittany and Fedward’s drinks writing. If you are interested in writing about drinks for us, by all means, please send me a writing sample. OK Cocktail Nerd, I’ll see your complaint and call, but not without first pointing out that you should work on your reading comprehension as there were three of us reviewing drinks for ARTINI this year and not just one reviewer. While I mentioned all three ladies’ drinks in my own conclusion, that’s because they were three of the four that I had tasted. I attended four feature nights (one each week) and paid for each of my cocktails out of pocket. If you read our weekly weekend posts it probably shouldn’t be a surprise that I count Alex as a friend, seeing as how I’m at the Passenger nearly every Sunday. I’m friendly with Chantal and Rachel simply because it’s hard not to be if you spend any time in DC’s cocktail culture. The first time I’d ever met Frank was on the Gibson’s ARTINI feature night, and I specifically praised his cocktail for its flavor and texture, so I hardly think that any bias I might have towards the bartenders I knew previously came into play in my own reviews. My reviews were honest and specific, and I tried to go beyond “this is bad” or “this is good” or, as you so eloquently put it, “they weren’t that great.” In my conclusion I favorably compared this year’s crop to last year’s, with links to a few of the posts from last year’s competition where I was less than positive. This year I think all the drinks I had were at least good, if not stellar. Brittany and Jenn were also very specific in their reviews, mentioning details that worked or didn’t about each cocktail they tried. If you liked or didn’t like something, can you say why? Show your work.